BROOKLYN, Mich.—Despite clutch problems that plagued him on pit road, Brad Keselowski dominated Saturday’s Carfax 250 Nationwide Series race at Michigan International Speedway. “I don’t need no stinking clutch,” Keselowski said shortly after crossing the finish line 3.179 seconds ahead of second-place Carl Edwards. No, he didn’t. Clutch or no clutch, Keselowski’s No. 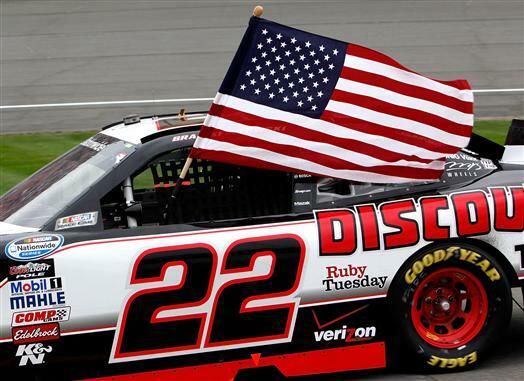 22 Penske Racing Dodge was the class of the field, starting from the pole and leading 89 of the 125 laps, in the first race for NASCAR’s new Nationwide Series car on a downforce track. Keselowski pulled away from Edwards after a Lap 117 restart, necessitated by the second caution of the race. Slow leaving the pits after a green-flag stop on Lap 105, Keselowski was running second, 3.4 seconds behind Edwards and closing, when the caution flag flew. The caution bunched the field and gave Keselowski the opportunity to pass Edwards on the restart. Keselowski now leads second-place Edwards by 347 points in the series standings. Kyle Busch finished third, followed by Justin Allgaier and Paul Menard. Joey Logano, Elliott Sadler, Reed Sorenson, rookie Colin Braun and Kevin Harvick completed the top 10. Danica Patrick came home 27th, four laps down, in her sixth race in the series and her first in the new car. 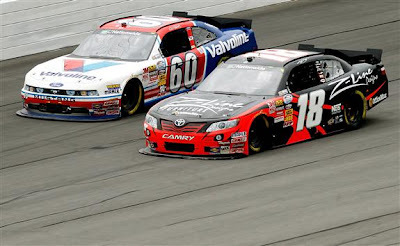 The Nationwide Series will use the new car in upcoming races at Richmond and Charlotte before its introduction as the full-time car in 2011. Saturday’s race dramatically increased Keselowski’s comfort level with his new Dodge Challenger. Edwards was aware that the second caution had deprived him of his best opportunity to win the race. “Until that last caution, I thought, ‘Man, we might win this thing,’ ” Edwards said. “Then we had the caution, and Brad was able to just launch out front on that last run. It was just a battle for second then. Keselowski and Edwards have a history of violent confrontations on the racetrack. In fact, both are on probation until the end of the year after a massive wreck on the last lap of a Nationwide race at Gateway International Raceway in July, where Edwards retaliated after Keselowski bumped him. At Michigan, however, they raced hard but without contact. The ingredients were there for another melee, Keselowski said, but on Saturday it didn’t happen. “The cake didn’t bake,” Keselowski said.